Dubai: The inauguration of Burj Khalifa — the world’s tallest building — will feature a spectacular display of fireworks, light beams, choreographed water displays and sound and music effects that will portray the evolution of the world’s most iconic new building in a breathtaking sensory journey. In all, 868 high-powered stroboscope lights will be integrated into the facade of Burj Khalifa and the tower’s spire — and each stroboscope will be operated individually to create a series of hypnotic lighting sequences. The entire display is controlled by a sophisticated arrangement of ultra-high-tech IT systems, which choreograph at least 50 sequences of lighting, fireworks, water and sound effects. Powerful strobelights will be fixed near the pinnacle of the tower, and six “narrow beam” searchlights will be positioned 700 metres up the tower. The entire inauguration consists of a pre-show and three themed acts — From the Desert Flower to Burj Dubai, Heart Beat, and From Dubai and the UAE to the World — and a fireworks finale. A giant screen on Burj Park Island as well as several television screens located in Downtown Burj Dubai including the Waterfront Promenade, will convey the inauguration to the spectators. The international media, including Dubai TV, will broadcast the event worldwide. The public can watch the inauguration from the Waterfront Promenade adjacent to The Dubai Mall. The inauguration begins with a short film depicting the story of Dubai and the evolution of the Burj Dubai as the world’s tallest building. The carefully choreographed sound, light, water and fireworks display will follow. The first act in the light and sound show, themed From the Desert Flower to Burj Dubai, is a co-ordinated water, light and fireworks display. 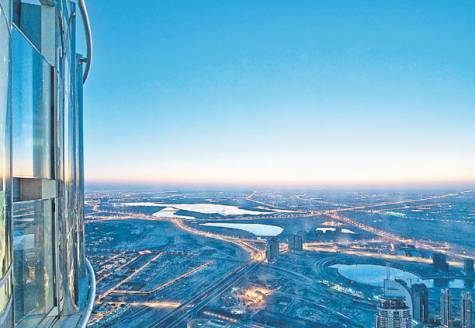 Guests can watch the unfolding of the desert lily, Hymenocallis, the design inspiration of the Burj Dubai. The segment ends with a rhythmic water and fireworks show. The second act, Heart Beat, captures the construction of the tower in a dynamic light show. An astonishing example of technological innovation, the display recreates the effect of a beating heart and uses no fewer than 300 space cannon projectors to generate a shadow-like image of the tower. In the third act, From Dubai and the UAE to the World, sky tracers envelop the tower in a strong halo of white light before reproducing the sunbeams of the developer’s corporate logo. These then expand in all directions as the lighting rig on the tower’s spire activates. In its spectacular finale, the show will feature an impressive show of 10,000 fireworks on and from the tower. The sparkling display will illuminate the entire Downtown Burj Dubai area. Other TV stations including international broadcasters in Arabic, English and Indian amongst others will have coverage of the Burj Dubai opening. Construction work on Kingdom Tower in Jan.